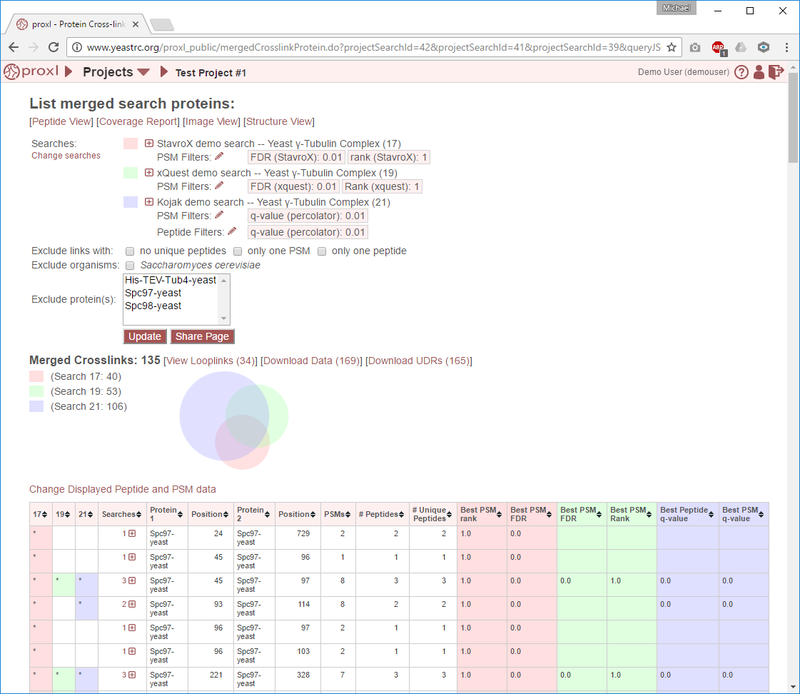 To reach this page, select multiple searches on the project page and click “View Merged Proteins”. (See Project Overview Page.) This page combines and collates the data from multiple searches and presents the results as an interactive table. The searches do not need to be from the same software pipeline. For example, different versions of the same program may be compared, or the results from entirely different programs (e.g., Kojak and XQuest) may be compared. Currently, the total number of merged searches must be 2 or 3 and must be from the same project. For the protein view page seen when viewing a single search, see Proteins View Page. This page is designed to present the data at the protein level, or the UDR level. That is to say that rows in the table represent distinct proteins linked at distinct positions. Rows in the table may be clicked on to view the data at the individual search level, and each of those searches may be expanded to view the underlying proteins, PSMs, and spectra. The Euler diagram (similar to a Venn diagram) provides a graphical depiction of the relative sizes and overlap between the proteins/UDRs found in the merged searches. The colors in the diagram match the colors used for the search list above. The search list is provided to the left of the diagram with their associated colors as a legend. The labels for each color include the search ID number and the number of crosslink or looplink UDRs found in each of the merged searches. The total number of crosslink or looplink UDRs resulting from the merge is presented in the header above the legend next to “Merged Crosslinks” or “Merged Looplinks”. The table presents columns describing the proteins/UDRs and indicates in which of the merged searches they were found. There is one row per UDR. Each row in the table may be clicked on to expand and view the protein-level data by search. Each of these searches may then be clicked on to view peptides, PSMs and spectra from those searches. The first 1-3 columns will be labeled with search ID numbers as headers, and provide an indication for whether or not the UDR in that row was found in that search. If found in that search, the cell for this search in this row will be shaded the same color associated with that search in the Euler diagram and search list at the top of the page. The column will also contain an asterisk. If not found, this cell is empty. The number of the merged searches that contain this UDR. 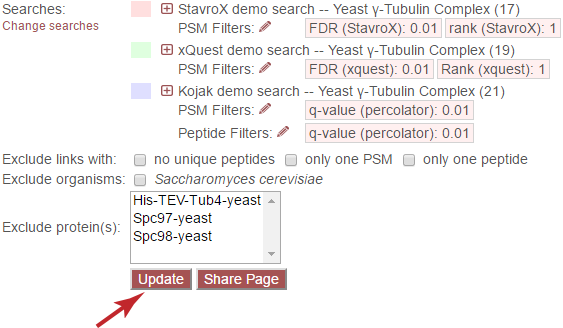 The [+] icon indicates that the row may be clicked on to be expanded to show underlying searches in which this UDR was found, the peptides and their statistics, and PSMs and associated spectra. The total number of identified crosslinked (crosslink view) or looplinked (looplink view) peptides meeting the filtering critiera that mapped to the reported proteins and positions. Note: The individual peptides may be viewed by clicking a row in the table to view a table of peptides. Rows in that peptide table may also be viewed to view the underlying PSMs and view spectra. Clicking on a row for a UDR will expand that row and present search-level data for that UDR–such as in which search(es) it was found, how many peptides were found for it, how many PSMs, and PSM- and peptide-level scores. Clicking on the search rows will expand to reveal underlying peptides. All peptides that meet the filtering critiera that were mapped to a protein-level crosslink or looplink may be seen by clicking on the respective row in the search-level summary. Additionally, all rows of this peptide table may clicked to view all PSMs associated with that peptide identification. The peptide-level scores for this peptide from this search. The best PSM-level scores for this search for this peptide for the PSM-level scores currently being used as filtering criteria. All PSMs meeting the current filtering criteria may be viewed for a peptide by clicking on a peptide’s row. Each PSM-level score for this PSM from this search are displayed in separate columns.